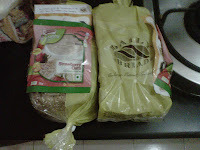 The above is a picture of Daily Bread's Healthy Whole Wheat Bread - Daily Bread is a premium bakery chain of Bangalore. The pleasant surprise to the bread buyer was a free 35 g pack of Strawberry oats from Britannia (worth Rs. 10/- along with the whole wheat bread). What was interesting and very appealing is the intelligent bundling in this offer: whole wheat bread is obviously purchased only by the health conscious and oats has its irresistible allure as a healthy food. Any whole wheat bread buyer will be charmed by the offer and will be amenable to buying the oats brand from Britannia later on when he or she considers. Now the moot question is will Daily Bread Whole Wheat Bread users switch over atleast partially from Whole Wheat Bread to Brittania oats? It is an interesting market study subject. Probably some students of marketing should take a survey of regular whole wheat bread buyers from Daily Bread and measure the qualitative and quantitative impact of this interesting (whole wheat bread + Britannia oats) sales promotion offer. There are bright chances of Britannia oats cannibalizing atleast partially the market of Whole Wheat Daily Bread since they are both positioned for the healthy snack time or breakfast time. Take my case itself: if I like Britannia oats (I am yet to try the free packet), I will probably substitute the whole wheat bread, with Britannia brand of oats - atleast partially - for some variety in my snacking or breakfasting - and thus reducing my consumption of whole wheat bread. So is this a win-win sales promotional offer? My final analysis as a marketer is that this sales promotional offer is more in favour of Britannia and less in favour of Daily Bread. However, one needs to validate this with questionnaire based study, collect primary data and may be apply statistical processing (apply null hypothesis, and see if my hypothesis is statistically significant or not). Marketing approaches are best analyzed using the Edward de Bono six thinking hat technique: see the situation from creative angle (green cap), emotional angle (red cap), facts and figures point of view (white cap), positive thinking (yellow cap) and finally, negative angle (black cap). After a discussion and thorough analysis the suitable marketing approach has to be adopted. Perhaps if Daily Bread had offered their brand of oats free along with their brand of whole wheat bread, it would have made a whole lot of marketing sense to Daily Bread. Any way I will be looking as a keen marketing student to various marketing conversations and media reports on this Britannia + Daily Bread (Whole Wheat Bread) sales promotional offer. As a consumer, I am happy with this bundled offer!! Thanks for reading this blogpost, please scroll down and read all other blogposts, click on older posts wherever required, kindly recommend this blog to your acquaintances.